There’s interesting news today for Apple iOS device users as it seems a Facebook Messenger app for iPad is on the way. As well as this it appears that an updated version of the iPhone Facebook Messenger app is to be released and it will feature Skype video chat. 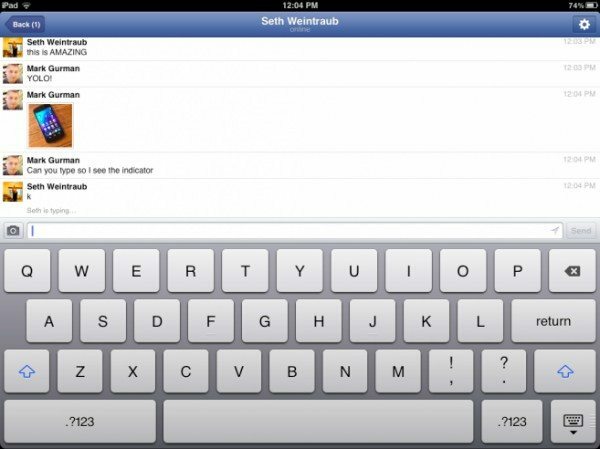 Previously the standalone Facebook Messenger app has been available for smartphones but now Facebook has plans for an iPad version and a source has provided comprehensive details of a beta version for the tablet. Apple device users will no doubt be pleased at Facebook’s commitment to bringing this app to further Apple platforms. News of Facebook Messenger for iPad comes to us from 9to5Mac, which quotes a “reliable source” for the details. The new iPad app is fundamentally the same as the app for iPhone but on a larger scale and features will include one-to-one messaging, being able to locate friends on a map, push notifications and group chat. It seems the program is being “actively developed” right now with new builds in preparation although there’s no confirmation that it will be available apart from internal-only operation, or a timeframe for an estimated release. In other Facebook and iOS news an updated Facebook app for iPhone is also in development that will not only offer improved performance but also Skype video chat. Testing on Facebook’s internal servers is said to be happening as we speak with a release of the updated app due in the summer. 9to5 Mac tells how it has already had an opportunity to give the new video chat function on the app the once-over and it appeared to run smoothly, at least for the majority of the time. As well as the updated Facebook Messenger for iPhone it looks as though there will also be an updated Facebook Messenger for Android, again due for a launch in the summer although the iPhone app update looks set to arrive first. We think many iOS users will be happy to hear about these latest Facebook Messenger developments for their devices. What are your thoughts on these upcoming apps and new features? Let us know by sending your comments. Facebook with Skype. Â Good be really, really good. If done right. FaceBook with Skype. Â Could be very good – if done right.